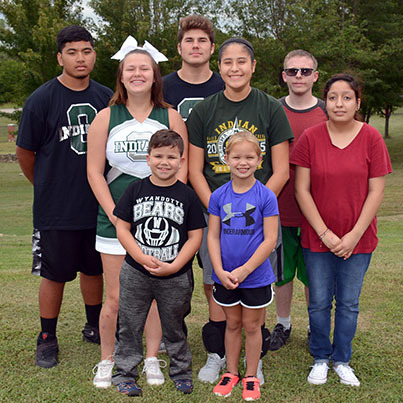 Oklahoma School for the Deaf’s homecoming court poses on the football field: first row, left to right: Krenchy Lokejack, Tyler Manek, Haden Denny; second row: Kayleah Chebultz, Jacey Pawpa, Rosalinda Reyes; and third row: Jansin Bohannan and Kadence Duncan. Sulphur, Okla. -- Oklahoma School for the Deaf Indians will host the Kansas School for the Deaf Jackrabbits on Saturday September 29, for OSD’s homecoming game. Volleyball will be at the Ken Brown Gymnasium on OSD campus starting at noon. Football homecoming crowning will start at 6:00 p.m. with kickoff at 6:30 p.m. on the Sulphur Bulldogs football field. The OSD senior queen candidate is Rosalinda Reyes. She is the daughter of Cathy Carmona of Oklahoma City. This is Reyes’ first year at OSD. So far she is involved in the Occupational Training Opportunities for Deaf career training program. She hopes to attend college next year and enjoys hanging out with her new friends. The senior king candidate is Haden Denny, from Midwest City. He is the son of Charles and Carrie Denny. Denny plays football and golf, and competes on the OSD Academic Team. His favorite class is computer technology with teacher Lawson Pair. In his free time, Haden likes to read, play games on his phone and hang out with friends. The junior class queen candidate is Jacey Pawpa. She is the daughter of Sandra and James Pawpa of Shawnee. Jacey plays volleyball and basketball, and enjoys studying English with teacher Jamie Wilson and art with teacher Denise Henry. After graduation, Jacey hopes to attend college, but has not decided on a major. Junior class king candidate, Tyler Manek, is from Yukon. He plays football, basketball, track and is a cheerleader. He is active in Fellowship of Christian Athletes and the OSD Key Club, which is believed to be the only club located at a school for the deaf in the U.S. Tyler enjoys welding, working out, riding 4-wheelers, fishing, hunting and most outdoor activities. After graduation, he hopes to attend a career technology center to become an auto mechanic. The sophomore queen candidate is Kayleah Chebultz. She is the daughter of Manda and Travis Chebultz and lives in Sulphur. Kayleah participates in volleyball, cheerleading, basketball and track. She enjoys her history and English classes and plans to study to become a veterinarian after graduation. Sophomore king candidate is K.J. Lokejak from Ponca City. He is the son of Luhy and Krenchy Lokejak. K.J. plays football, basketball and golf at OSD. He enjoys English class and in his free time he plays video games and basketball. The flower girl is Kadence Duncan, daughter of Amber Duncan of Seminole. Kadence is in second grade. Her favorite class is physical education. She hopes to become a basketball coach when she grows up. She likes to play on her iPad in her free time. The crown bearer is second grader Jansin Bohannan. He is the son of John Bohannan and Natasha Foreman. His favorite class is spelling. He hopes to be an artist when he grows up. He loves to draw in his free time. As the state resource center on Deafness, OSD has more than a 100-year history of providing educational resources to deaf and hard of hearing students, ages 2 through 12th grade, throughout the state of Oklahoma. The school serves students at the main campus in Sulphur and two early childhood centers for ages 2 years through third grade in Chickasha and birth through 5 years in Edmond.